I have heard that Laughing Cow cheese laughs, sorry, lasts 5 days solid in the bush. I checked this stuff out in the supermarket and found the stuff below. Laughing Cow is a creamy cheese and I am very surprised that a creamy cheese would last that long. I thought it was the drier cheddars that were better. Can anyone confirm? Same spot you will find Nutella in portions. Yet to see peanut butter ready packed. Laughing Cow is definitely in the fridge at my local Woolies. I bought some yesterday. It also says "Keep Refridgerated" on the packaging. Either Laughing Cow has different products or the product has changed over the years. It used to be on the shelf at our local supermarket but is now found in the refridgerated area. No, there is, and always has been, a refrigerated and a non-refrigerated version. I bought a pantry pack, i.e. non- refrigerated as recently as Xmas, but never used it. It has a best before date of 28.08.2017. As the previous posters have stated, you find it in the spreads section of the supermarket. If you have the refrigerated product then you are buying the wrong stuff. Definitely still listed on the Woolworths web site. And the Coles web site. The whole raison d'etre of cheese is to preserve milk, apart from being delicious. Cheesemaking was developed long before refrigeration and relied on storage in cool conditions such as caves and cellars around 10-15 degrees, not "below 4 degrees" as we are now lead to believe. Unless you are walking in quite hot conditions any cheese will last five days without refrigeration by keeping it away from the direct heat of the sun. I regularly take brie/camembert on walks without problems and have put them in food drops that were used within 2 to 3 weeks of placement. Harder cheeses handle longer storage. Laughing Cow is "cheese spread" (see previous image) so more like Kraft processed cheese; to me a culinary abomination. Mark F wrote: Laughing Cow is "cheese spread" (see previous image) so more like Kraft processed cheese; to me a culinary abomination. My interpretation: Laughing Cow won't last five days since it's "bad" straight out of the store refrigerated section. When I bushwalk I often take cheese, frequently soft-ripened cheese. In Tasmania one of my favorites is the King Island Stormy. It's intensely stinky and gets better with time at room temperature. Some of the Bruny Island cheeses can be good as well. There was one some years ago called "Mr. Palomar" that we took on the Western Arthurs. It was the best that Bruny Island ever made in my opinion. Soft, so stinky and very, very delicious. I would pay handily to have it again but as far as I know they never produced it after that year. By the way, I think the image posted by the OP is for the U.S. version of Laughing Cow. The Australian L.C. producers put French on the label and the ingredients are a little different (although not that different). If you go down the Laughing Cow path, make sure you taste it before you rely on it out bush. I find it like eating cardboard but my kids like it. We survived on it doing the Overland Track in Late Dec 2015. It was quite warm but the cheese was good. It stopped the flatbread being so dry! Just suggest keeping it in its cardboard box. I didn't and it got squashed flat and had to pick bits of foil out. When the group reached Narcissus and we pooled all remaining food, another person in the group pulled out a perfect box of cheese! The question was will it last? I took it on a 7 day walk along the South Coast (Tas) and it was fine. In fact I still have some of that in the fridge and am using it. I also took some on a 14 day walk on the Larapinta Trail last July and it was still okay on the last day. We buy it off the shelf in the spreads section down here. Instead you should find the similar products named Cheesestix wedges or Picon cheese spread. Package says store in a cool place as mentioned above. I couldn't find the tiny cans of olives, will have to look at a larger store. 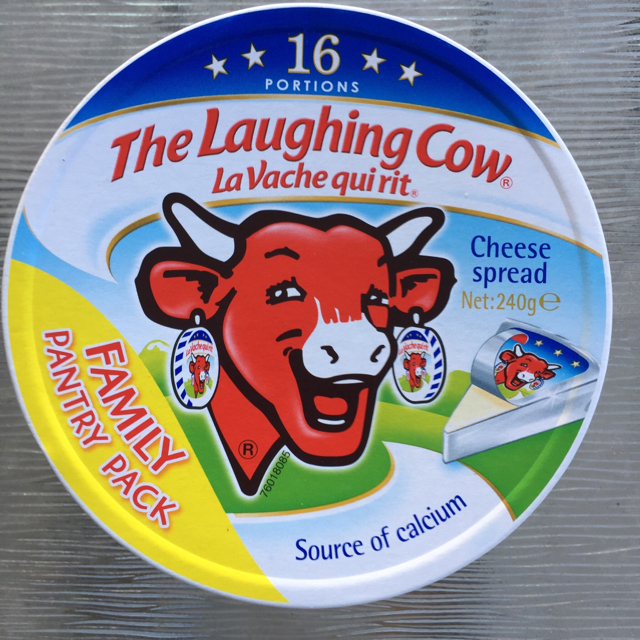 I don't think laughing cow needs to be kept in the fridge. It would be highly processed and full of preservatives. A better option is a block of Parmesan cheese which jerks for at least a month. It's fantastic cheese. Stroller wrote: A better option is a block of Parmesan cheese which jerks for at least a month. It's fantastic cheese. Wow, no wonder its so hard! Yesterday I bought a pack of both types of Laughing Cow from Coles. The "keep refrigerated" one had a best-before date of October 2018, and came in a pack of eight 16-gram wedges. The shelf-stable "pantry pack" had a best-before date of November 2018, and came in a pack of sixteen 15-gram wedges (I have also seen these in 21-gram wedges). The reason I bought both was to do a taste test. The two types look identical, have the same texture, and taste identical to me. My question is, after you’ve been carrying this for 5 days through the bush, would you be hungry enough to eat it? Yes it really does last. If it is very hot, it gets a bit soft and squishy but is otherwise ok. There is no "refrigerated version" the 8 portion pack and the pantry pack are the same product and I have no idea why they put one in the refrigerated section and one on the shelf, unless it is for marketing purposes. I confess I like the stuff (don't ask me why, I loathe processed cheese otherwise) and spread it on bread instead of butter when making sandwiches. I sometimes eat a triangle as a quick snack. matagi wrote: I confess I like the stuff (don't ask me why, I loathe processed cheese otherwise) and spread it on bread instead of butter when making sandwiches. I sometimes eat a triangle as a quick snack. ChrisJHC wrote: My question is, after you’ve been carrying this for 5 days through the bush, would you be hungry enough to eat it? I think it would take more than 5 days. LachlanB wrote: I think it would take more than 5 days. For a four day trip I can take things like avocado. For five or more days, the cow gets the last laugh.